also known as Krishnashtami, Saatam Aatham, Gokulashtami, Ashtami Rohini, Srikrishna Jayanti, Sree Jayanti or sometimes merely as Janmashtami, is an annual commemoration of the birth of the Hindu deity Krishna, the eighth avatar of Vishnu. The festival is celebrated on the eighth day (Ashtami) of the Krishna Paksha (dark fortnight) of the month of Bhadrapada (August–September; However, in both traditions it is the same day. So, we have works like Vishnudharmottara Purana saying Krishna Ashtami is in the Bhadrapada month and Skanda Purana stating that it falls in the month of Shravana) in the Hindu calendar. Rasa lila, dramatic enactments of the life of Krishna, are a special feature in regions of Mathura and Vrindavan, and regions following Vaishnavism in Manipur. 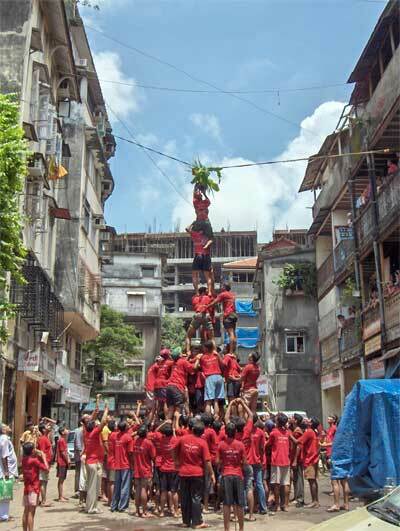 While the Rasa lila re-creates the flirtatious aspects of Krishna's youthful days, the Dahi Handi celebrate God's playful and mischievous side, where teams of young men form human towers to reach a high-hanging pot of butter and break it. This tradition, also known as uriadi, is a major event in Tamil Nadu on Gokulashtami. for Radha Astami, see below.
. Bhagavad Gita and Krishna . Radha, it is believed, is no different from Krishna. Both Radha and Krishna srt the ball of romance rolling in the minds of Indians. Love is sublime and love is sensual, too. Love is life and life is loe. Love and life are inseparable. These form two poles of the magnet. It is the front and rear end of the same boat to ferry all in the ocean of life. On this auspicious day let us celebrate life, let us celebrate love, let us offer our prayers to Radha. Her union with Krishna forms the cosmic energy that drives man to be creative, and her separation from Krishna prompts man to transcend space and time to achieve superior goals. There can't be Krishna without Radha. Life is incomplete without love. Glory to Radha rani. Lord Krishna was born on this day. The Lord is very special to all Indians. He is worshipped not just a Creator or an Avtar (incarnation) but as one who has set standards in every aspect of life - war and peace, art and literature, love and life, friendship, protection of virtue, relationship as a son, a brother, a friend, a lover, and even a king! He was equal to his friends and enemies. On His sacred birthday let us embibe His divine qualities to create a better and happier society based on love, affection, friendship and peace. His affection to mother Yashoda is beyond every emotions. His love for Gopis, specially Radha, is exemplary. His four hands are symbols of four aspects of life: lotus for love of beauty and nature, conch is part of music and partly to give a wake-up call to rise above self, mace to discipline who errs and wheel (chakra) to move, to progress and initiate course corrections for the guilty. Lord Krishna stands for love and virtue. May He bless us all on His birthday. 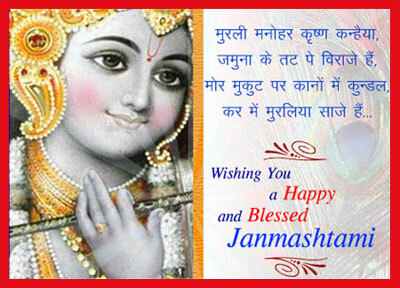 Janma means birth and astami means eighth, here eighth day according lunar calendar, i.e. he was born on eighth day of the dark phase of this lunar month. "Gita Jayanti" is the birthday of Bhagvad-Gita, the sacred text of the Hindus. It is celebrated on the 11th day of the waxing moon of Margaseersha month (December- January) in the Vedic almanac. 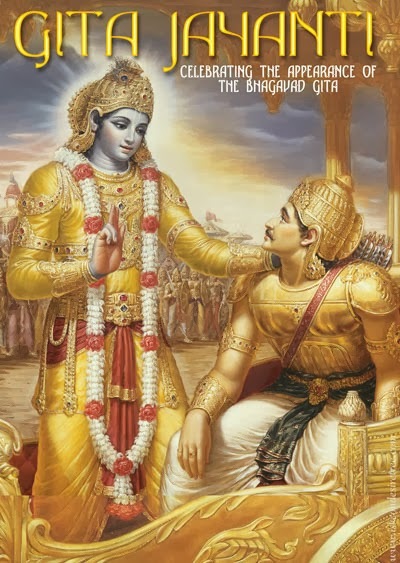 It is believed the immortal "Bhagavad Gita" was revealed to Arjuna by Sri Krishna himself in the battlefield of Kurukshetra (in present day Haryana, India) a little over 5000 years ago. The text is written in third person, narrated by Sanjaya to King Dhritarashtra as it transpired between Sri Krishna and Arjuna. Sanjaya, the secretary of the blind King Dhritarashtra, had been blessed by his Guru, Vyasadev, with the power to remotely view the events taking place on the battlefield as they transpired. Gita Jayanti Festival as the name suggests is a unique and exceptional festival dedicated to the birth of Srimad Bhagvad Gita, the holy book of Hindus. The festival is celebrated mainly in Kurukshetra, Haryana. The festival is very sacred to Hindus and is celebrated with immense devotion and dedication.to be the land where the essence of real Hinduism found place. The full form showing complete Godly manifestations of Shri Krishna on request of Arjuna on Kurukshetra battlefield while preaching sacred Gita.